From the very beginning Goat Girl were always threatening to turn into a special band. Songs that use subtlety as their main ingredient while remaining disarmingly fierce at every turn. Lyrics that mean everything despite being written down in the most simplistic and non-aggressive way possible… they are an anomaly in the UK music scene as 2016 draws to a draggy close: four people playing guitars, bass and drums who have the ability to make you feel //alive// again. Named in reference to the questionable Bill Hicks comedy sketch Goat Boy (“It’s disgusting,” says Lottie, although she’s quick to add: “But I like his social commentary, and the satirical element to what he did,”) the band are fresh out of their respective London colleges and a million miles away from everything else ‘new’ you’ll hear right now. Goat Girl currently have upwards of 20 completed songs, each one a caustic commentary on the England they’ve grown up in. Next month they finally get around to releasing two of them on Rough Trade: ‘Scum’, quoted at the top of this article, is as full-on and dead-eyed as British rock music gets, while ‘Country Sleaze’ is a brooding two-chord time capsule that sounds like it’s been beamed over from a Seattle divebar in 1989. Both tracks were recorded purposefully quickly in a no-nonsense north London studio a few weeks ago with fast-rising producer Margo Broom. “There’s teenage angst in them,” says Ellie. “But I think that was inevitable, growing up in London over the last ten years.” All four members of Goat Girl are under 20, but their relative youth isn’t what makes them stand out. Rather, they feel so compelling because of they way they expertly pick through the holes of so-called millennial culture, not to mention the way the media and government are messing with the minds and future plans of an entire generation. They’re truth-tellers, and this is surely the reason why so many people have been leaving Goat Girl gigs open-mouthed recently. Unassuming in person, Lottie’s brilliant words undoubtedly propel Goat Girl. But as a band they’re very much a democracy, with each member as integral as the last. Just check out guitarist Ellie’s unconventional playing on fan-favourite and future anti-anthem ‘Burn The Stakes’, as well as the way drummer Rosie and bassist Naima gel on the droning, soul-spluttering ‘You’re The Man’, which is also their catchiest track to date. Goat Girl’s raw brand of classic garage pop subversion has proved irresistible to those in the know so far, which is why despite barely playing any shows in public before this summer, nearly every day in the first quarter of 2016 a fresh face from the music industry would randomly appear at the band’s dark and damp rehearsal space in south London, contract in hand, desperately trying to sign them. 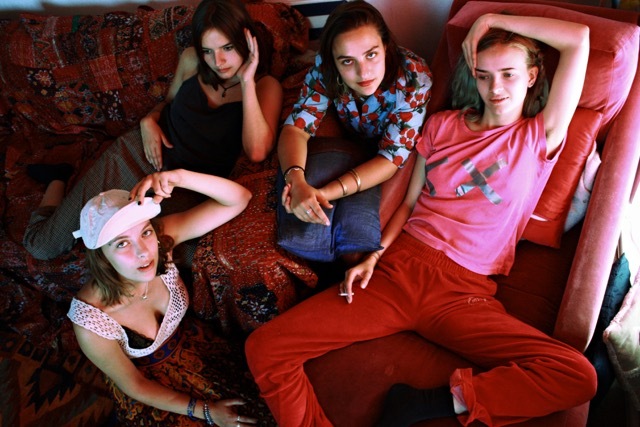 “It was kind of annoying, we just really wanted to write songs at that point!” says Lottie, adding that ultimately, being afforded the time to grow as a band was why Goat Girl decided to go with Rough Trade. “We signed on the same day as the Brexit result,” says Rosie. The irony was lost on nobody. As a unit, Goat Girl say they’re torn on politics. Lottie’s lyrics explicitly deal with issues most other acts in 2016 seem scared to even skirt around, but the band are also acutely aware of how easy it is to become a cliché, to be labelled and put in a box. As rare as they are refreshing, the band’s plan from here is simple: get ‘Country Sleaze’ and ‘Scum’ out into the world ASAP, hit the road, and record a debut album that has, as Naima puts it, “spirit, strength and simplicity” at its heart. Savvy and effortlessly inventive, Goat Girl are London in 2016 - and suddenly London feels real again.